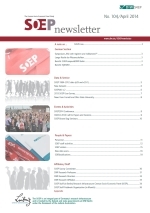 We would like to inform you via email about new issues of the SOEPnewsletter. Please send an email to soepmail@diw.de or subscribe yourself to the list mentioned below. Then we will send you information about each new issue by email to the address you enter below. To become a member of the list please subscribe: here, and confirm your subscribtion by replying the E-mail from our list server 'sympa'. To unsubscribe from the mailinglist please send a mail to sympa@list.diw.de, subject: unsubscribe soep-nl.